On the 11th of August 2017 WIM UJ held its first Young Women in Mining Conference at the University of Johannesburg. The SAIMM YPC attended the event in support of Young Women In Mining which aims at empowering the next generation of young women in the Industry. Women in Mining UJ is currently the only female mining structure in the four South African mining schools. WIM UJ has initiated the first annual young women in mining workshop in 2016 which was held by the Department of Mineral Resources and the Mine Health and Safety Council of South Africa, working in line with the mission and vision of WIMSA. Professor Selo Ndlovu is an Associate Professor at the School of Chemical and Metallurgical Engineering at Wits University and President Elect of the SAIMM. She holds a DST/NRF-funded research chair (SARChI) in Hydrometallurgy and Sustainable Development. She presents hydrometallurgy courses to chemical and metallurgical engineering students at both undergraduate and postgraduate levels, and also supervises Master’s and Doctoral research students. I recently sat down with her for a chat about her career, students, and the SAIMM. This was shortly after the successful Hydrometallurgy Conference, for which she was the chairperson of the organizing committee. We spoke about her choice of metallurgy as a career, the importance of postgraduate studies, women in engineering, as well as the importance of organizations such as SAIMM. IT: What sparked your interest in metallurgical engineering while in high school? Prof. SN: When I was a student I was drawn to mathematics, physics, and chemistry, specifically inorganic chemistry. Further to that, we were taught about the processing of different materials to make products. We were taught about the Bayer process for the production of alumina, the Haber process for ammonia production, the production of sulphuric acid etc. I found all that fascinating. I wanted to know how I could apply such knowledge, and what the impact would be in the community and industry. In my final year of high school we had a career fair. We had university and industry people coming to tell us about metallurgy – that metallurgy is related to mining, and that almost everything around us has passed through some metallurgical process. When I saw how the chemical and physical characteristic of metals can be manipulated in order to extract metals from ores and move from a solid rock to a solid metal and started connecting it to all that I had learnt in high school, I was captivated; I felt this was where I wanted to be. 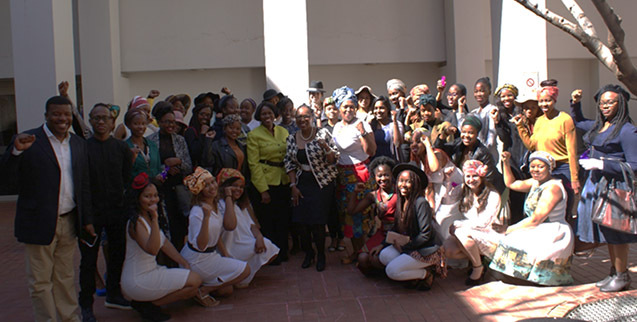 The Tuks Mining Society, in association with the Built Environment Society of Tuks, hosted their very first Women in Leadership workshop at the University of Pretoria’s main campus in honour of Women’s Month. The theme ‘It used to be a man’s world!’ was around challenges faced by women in management in ‘traditional’ male-dominated industries (engineering, the built environment, and IT). The dress code required the ladies to come wearing big hats or head wraps and gloves, which spoke to young women celebrating their femininity wherever they are! The programme started at 9:30 with a brief meet-and-greet among the students and organizers. The speakers included Nondumiso Boya, an operations manager from Eskom, Stella Buthelezi a business owner in the oil, mining, and cosmetics sectors, and Princess Thwala, one of the group executives from African Rainbow Minerals. The speakers’ addresses were followed by an interactive question-and-answer session, which tackled critical non-technical issues faced by women in management positions. The formalities were then concluded by a great networking session and brunch. It was an honour and privilege to take part in the 2016 Career and Leadership Conference. This prestigious event, which was hosted in the Wits Great Hall, provided an insight into the challenges that are currently faced by the mining industry. I was also grateful for the opportunity of seeing different stakeholders from the mineral sector gathering for the same purpose, from students in the mining and metallurgy schools of four universities (Wits, UJ, UNISA, and UP), academic staff, and mining industry executives such as Thabile Makgala, Vice-President of Strategy and Development at Gold Fields and Thabo Moloto, Director of Operations at Shaft Sinkers. The conference provided me with an opportunity to learn that, as the future leaders of the industry, we cannot ignore the fact that the mineral sector is currently not doing very well. This is due to a number of factors, amongst others that the mining industry is still struggling to recover from the global financial crisis; hence most students are becoming uncertain about their future in the sector, especially those whose studies are not funded by mining companies as they cannot be assured of employment after graduation.